Like many things in the United Arab Emirates, Etihad Airways has gone above and beyond what most of us will ever expect. Today, the airline showcased their new "Residence" First Class suite. Most of us will never get to fly in it, but let's give it a look anyway. "These new living spaces will raise inflight product and service standards to their highest level yet in commercial aviation and alter air travellers' expectations of inflight comfort and luxury forever. Etihad Airways' A380 and B787 will deliver the most advanced airline cabins in the industry, while meeting all weight, range and cost targets at our desired seat count. This will allow us to offer products unparalleled in quality and style, yet at competitive prices across all three cabins." The new products are the result of a project that began in 2008, when Etihad came to the realization that their customers' needs varied depending on the route and aircraft they were flying. So the airline has since opted for a different experience on each fleet type, rather than a cut-and-paste format like some airlines use. $20,000 is what you'll have to fork over to fly in The Residence from Abu Dhabi to London. Hogan predicts that large families and dignitaries will book the Residence. Etihad has ten A380s on order, with the first expected to arrive this December. It will be flown from Adu Dhabi to Sydney and Melbourne, via London. Each A380 will have only one Residence on board. The Residence seating features the same leather as a Ferrari and also includes its own butler. 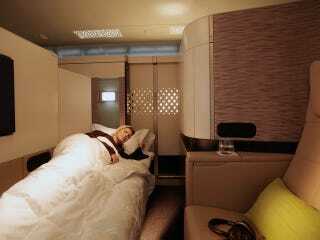 Etihad is calling the rest of their First Class seats "Apartments" and they're spacious in their own right. If you have to settle for Business Class, (*please note the sarcasm) you'll find their new "Studio" seats quite sufficient. Etihad's new Business Class "Studio"
All First and Business Class passengers will be provided noise cancelling headphones to use along with the most advanced in-flight entertainment system in the skies, the Panasonic eX3 system. Passengers will use touch-screen menus to select from over 750 hours of on-demand entertainment and gaming. A chilled mini bar will also be at arm's reach. Etihad has also upgraded their Economy Class to what they call a Smart Seat, which features an ergonomic, adjustable headrest. Each seat will have its own touch screen for access to on demand entertainment.